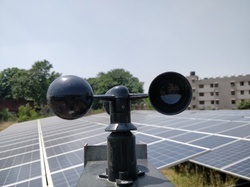 These meters can measure wind speed, temperature and air volume with wind speed average/Current/Max and data hold function. USB interface to quickly transfer data to PC. These meters can be widely used in environment, ocean and flying industries, etc. We are one of the well-distinguished companies in the market that is into providing Multifunction Anemometer. We follow IS: 5912: 1970 standards in the manufacturing of Anemometers. The purpose of our anemometer is to measure the velocity of wind. The first-rated class anemometers are very important meteorological equipment. We are offering an amazing range superior Handheld Anemometer to our clients. 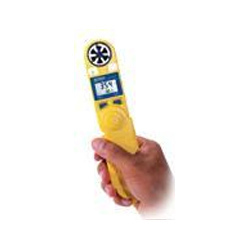 Handheld anemometer with digital display. Registers wind speeds up to and over 100 mph. Powered by a coin battery for 1-2 years of typical use. Use this wind sensor for kitesurfing, windsurfing, target shooting, model aviation, weather monitoring, and all kinds of wind-related activities. The instrument measures total run of wind passing at the point of observation through mechanical counter of the range 0 to 9999.9 km. The counter is housed in a metallic box with a window to observed digits. A steel spindle carries the cup assembly and drives the lay shaft by worm and wheel, the worm is pinned onto the spindle.